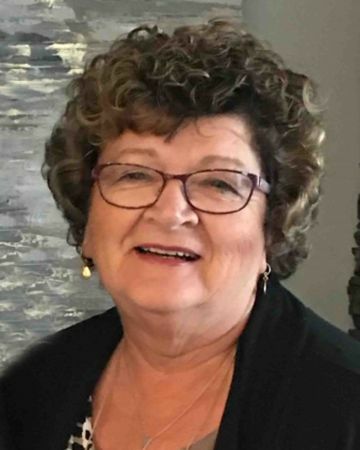 Memorial service will be held at 1:00PM on Monday February 4, 2019 at the Winkler Mennonite Church. Viewing will be from 1PM-3PM and from 7PM-9PM on Sunday at Wiebe Funeral Home, Winkler. Interment for family and close friends will take place at 11:30AM prior to the service at Westridge Memorial Gardens. Donations may be made in Viola's memory to either the BTHC Foundation (designated to Palliative Care) or to Central Station. On Friday, February 1, 2019 at Boundary Trails Health Centre, Viola Wiebe (nee Kuhl) age 66 of Winkler MB, went to her eternal home. She is survived by her husband, Frank A Wiebe, and her children, Laurie (Warren) Dyck of Winkler, Jennifer (Jason) Rekker of St. Catharines, Ontario and Tim (Corissa) Wiebe of Winkler, seven grandchildren, Dilan Dyck, Mitchell Dyck, Nicole Dyck, Madeline Rekker, Reece Rekker, Cole Wiebe and Alexis Wiebe, and two brothers and one sister of Winkler. She was predeceased by her parents, David P and Tina Kuhl, and her sister, Doris Hildebrand. Life began for Viola on March 27, 1952 as her parents welcomed her into this world at Bethel Hospital in Winkler. She came as the fourth of five children and was raised on a farm in the District of Blumstein. Viola’s childhood stories were filled with a little adventure, hard work and mischievous moments. It was a rich life that taught her to work, play and love as they milked cows, harvested fields and tended a large vegetable garden. Frank and Viola were married on Sept 6, 1970. They began their married life with big dreams, settled in Birtle, MB where Frank worked as a school teacher. By 1978, the family was completed and settled in Winkler with their children Laurie, Jennifer and Tim. Family life was good. With the kids in school, Viola kept busy with home life, sharing coffee with many, and supporting her extended family. She was also involved in various community and Church committees. Eventually her work life expanded to include work as a nurses’ aid for Salem Home. She had a special gift of loving the elderly and caring for them with pride and respect. A few years later, she also worked at a local fabric store until her Grandma role required more of her time. Viola became a Grandma at the young age of 42. The grandkids brought out the young heart in her where she was often found to play games and get crafty and creative with boxes of all sizes! Golf was a game Viola enjoyed playing with Frank, grandkids and with the women in the golf league. Viola also loved to sew. She sewed many articles of clothing, denim blankets, aprons and so much more. She could fix any zipper that appeared broken and hem any pant to look like the original. Viola and Frank took time to travel to various parts of the world. They were also able to serve others through Mennonite Disaster Service projects. Viola’s ability to accept others and extend hospitality served her well. She was great at meeting people where they were at and making them feel loved, supported and accepted in their hurts. This came from the overflow of her heart and her love for God. Since mid-October 2018, Viola’s cancer journey was hard and yet beautiful. This time held many physical and emotional changes that will never be fully understand. Although her passing is much too soon, given her journey, she is now free. Memorial service was held at 1:00 p.m. on Monday February 4, 2019 at the Winkler Mennonite Church with interment prior at Westridge Memorial Gardens. Special thanks to the many that cared for Viola - family, friends, the Church community, the Palliative Care team at Boundary Trails Health Centre and Wiebe Funeral Home. Donations may be made in Viola’s memory to the BTHC Foundation (designated to Palliative Care) or to Central Station. Frank & Family, so sorry to hear the passing of Vi. It breaks my heart, she was such an amazing person & my friend. Always cared about the next person, also praying for someone. Thanks Vi for all your prayers for me and your friendship. You’re in heaven and rejoicing with your sister. Both free of pain...till we meet again!!! Dear family. We have so many great memories of times spent with Vi. Her vivacious and positive outlook was always an encouragement to us. Our love and prayers to you as you process this part of life’s journey. Frank and Family, we are so sorry to hear of Viola’s passing. My Mom, Edna Burry, always spoke fondly of her. Our prayers and thoughts are with you and your family at this difficult time. Frank and family and the Kuhl family, so sorry to hear of Viola's passing. Our deepest sympathy to you all. May the memories of time spent with Viola be of comfort to you at this sad time. Though we know that heaven has welcomed a very special lady, our hearts still feel the sorrow. Vi was such a positive influence on me, she will be greatly missed. Frank - I am so sorry to hear of Vi's death. I'm glad I had a chance to meet her this fall after hearing so many wonderful things about her over the years. You will be in our thoughts. Vi has transitioned to another place and now wonderful memories will fill your mind, but our hearts still feel the sorrow. Our thoughts and prayers are with you. Our condolences to Frank and the family! Frank and Family. Our hearts go out to you. So many great memories of our Morden days and later. Always loved Vi’s cheerfulness and positive approach. She was always willing to help where she could. Wanted to be with you today but weather did not co operate. Love to all of you!